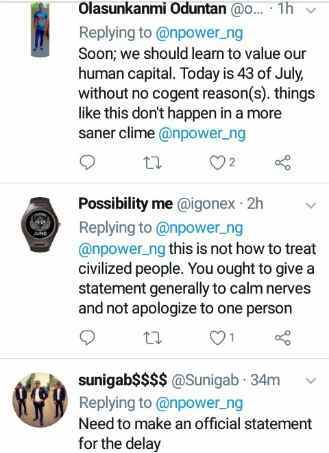 N-Power Volunteers are beginning to ask questions as in why the delay of July stipends as they can no long bear the hardship anymore. Today is 13th August, 2018. And no news regarding July stipends payment. 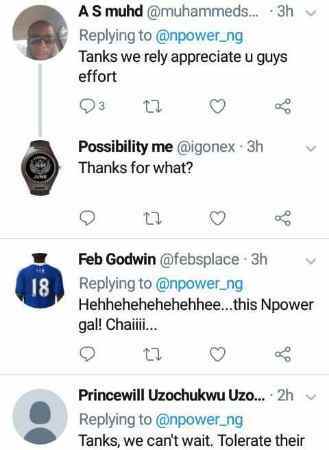 Yesterday, some Volunteers reacted to N-Power replies to a question asked by a Volunteers as when the July stipends will be paid. 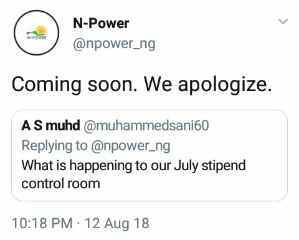 This time is obvious that we can understand, what is going on about July stipend. Please tell us the reasons of the delay. What's the reason for the delay in the July salary? You don't just keep people in the dark. Government is expected to make a public statement on this crucial matter. How do you expect the poor beneficiaries to survive under the present economic circumstances without their allowance. The money isn't much we know but delaying it is suicidal!